Click to Enlarge.ORG, The Public Interest Registry (PIR) today announced that it has taken the final step to become the first generic top-level domain (gTLD) to offer full deployment of Domain Name System Security Extensions or DNSSEC. "We are proud to take this next step in DNSSEC deployment and transform the vision of a safer internet into a reality," said Alexa Raad, CEO of .ORG, The Public Interest Registry. "The public's interest is at the core of our mission at .ORG — especially as Internet usage continues to grow exponentially. DNSSEC serves as tamperproof packaging for DNS by not only preventing identity theft as a result of "man-in-the-middle attacks", but also enabling innovation in applications that rely on DNS." 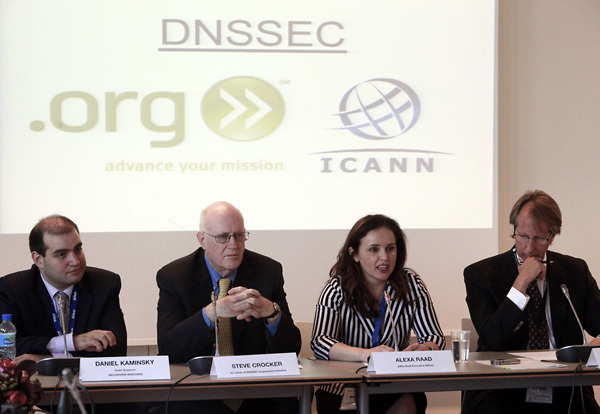 Raad made the comment during a news conference at an international meeting of the Internet Corporation for Assigned Names and Numbers (ICANN) in Brussels, Belgium. "The fact that .ORG is the first generic top-level domain to rollout DNSSEC means that we have taken a significant step closer to a more secure Domain Name System," said Rod Beckstrom, President and CEO of ICANN. "It would be a mistake to think that DNSSEC is going to solve all the problems involved in cybersecurity, but it is no less a mistake to underestimate its importance in moving the Internet towards a more secure environment where online users can receive assurance that they've ended up at the web site to which they want to go." .ORG is the third largest domain and its acceptance of second level signed .ORG zones culminates an extensive two-year process in the domain's rollout of DNSSEC. Registrars can offer added security protection to their customers by enabling .ORG website owners to sign their respective domain name with DNSSEC validation keys. "Registrants will benefit from the added ability to thwart certain specific types of cyber attacks," said Steve Crocker, Co-Chair of ICANN's DNSSEC Deployment Initiative. "It will help curb threats like pharming, cache poisoning, DNS redirection and domain hijacking — all of which have been used to commit fraud, distribute malware, and identity theft." To see a video recording of the .ORG/ICANN news conference in Brussels, go here: http://www.icann.org/en/press/. Local Time: Friday, April 19, 2019 05:26 AM PDT – Page Load: 1.1560 Sec.